In the year 2040 Monty Meekson had a hard job working as the right-hand man of a billionaire. His boss James Crassus would bark out an order, and expect Meekson to do the job, moving heaven and earth if necessary. If the job wasn't done just right, Crassus would dish out a tongue-lashing that Meekson would always endure stoically, without talking back. Despite his important role, Meekson was paid little. Crassus never paid his employees generously. One day Crassus assigned Meekson the job of coming up with radical new ideas to help Crassus earn his second billion dollars. Meekson met with Crassus, and presented his list of ideas. “Your ideas are worthless rubbish!” yelled Crassus. “Yes sir, Mister Crassus,” said Meekson. Crassus explained his wild idea. His company would get involved in genetic engineering humans. A hundred genetically engineered babies would be produced. But the babies would not be genetically engineered to be more intelligent than normal humans. The babies would be genetically engineered to grow up to be obedient, unquestioning workers who would not mind working in the factory for 80 hours a week, beginning at the age of 12. The whole project would be kept secret, unknown outside of the company owned by Crassus. Hiring scientists who would work in secret, Meekson arranged for the genetic engineering to be done. A hundred female eggs were combined with male sperm, and the fertilized eggs were then raised in 100 special glass incubators. Eight months later, the hundred babies were born. They were raised together in the same special child-raising facility, which was manned by ten employees each charged with taking care of ten children. Crassus refused to pay for any more nannies, demanding that the children be raised as inexpensively as possible. When the children approached four years of age, Meekson asked his billionaire boss how the children should be schooled. When the 100 children reached the age of twelve, Crassus ordered that they should begin their jobs at the secret armaments factory. The children did not object to the 80 hours of work each week, for they had been told for seven years that this is how they would have to work when they reached the age of 12. The children knew of no reality beyond their company's facilities and factory. For two years, the productivity of the children was very high. They toiled at their hard jobs with few complaints. They lived in barracks like soldiers. Whenever one of the children complained, he could usually be pacified by giving him some candy, something the children had been denied in their childhood. But eventually somehow one of the 100 children learned that 80-hour work weeks were not normal for fourteen-year-old children. The information quickly spread. The children began to talk among themselves. One day they refused to work, demanding better conditions and shorter working hours. “You idiot, the scientists you hired probably bungled the genetic engineering,” said Crassus to Meekson. “The 100 half-people weren't supposed to be capable of such independence.” It never occurred to Crassus that maybe the human spirit was something that went beyond a person's genes. Meekson got the gun, but he couldn't bring himself to pull the trigger. He told Crassus what had happened. “Oh, so you got a little problem – well, I'll fix that,” said Crassus. Crassus went with Meekson into the factory, and asked for the gun. Crassus then shot one of the young workers, killing him. “This is how you'll all die if you don't get back to work!” shouted Crassus. When Crassus returned from his business trip to France, he went into the factory to inspect it. There were no workers there. Enraged, he summoned Meekson. “You scum, I will destroy you!” raged Crassus. 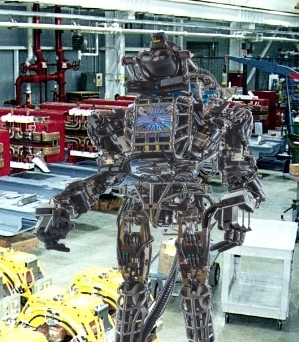 Crassus looked around and saw a killer robot at the end of one of the factory's assembly lines. He switched on a switch on the robot's side. The robot stood up. “Robot, do as I command,” said Crassus. “Kill human!” Crassus pointed to Meekson. The robot reached out its metal arms, and strangled Crassus to death. “That's a good robot,” said Meekson with a chuckle, turning the robot off. He thought to himself: I'm lucky these silly things are so stupid. In the philosophy of science there is something called the miracle argument, which argues that the “predictive success of science” implies that scientific theories must mainly be true, or else this “predictive success” would be a miracle. But is it correct to claim that mainstream science has done very well at predicting discoveries about life, mind, and nature? How good is the "crystal ball" of mainstream science? Another important discovery about the universe is that its laws and fundamental constants seem to be very fine-tuned, having a long set of “coincidences” necessary for the existence of intelligent life. Slowly emerging between the years 1970 and 2000, this discovery was not predicted by any scientist that I am aware of. Nothing in the pre-existing model (ca. 1970) pointed toward the need for dark matter or dark energy; the observations that motivated these hypotheses came as a complete surprise. Nor was the mass discrepancy—acceleration relation anticipated before it was established observationally. Then in the 1990's there came the discovery that the expansion of the universe was accelerating. This came as a total surprise to cosmologists, none of which (to my knowledge) had predicted any such thing. To account for this fact, cosmologists came up with the idea that most of the universe's mass-energy was some mysterious thing called dark energy. Such a thing had not been previously predicted by cosmologists. The only relevant prediction that had been made was the prediction of quantum field theory that the vacuum of space should be filled with something like dark energy, but more than 1,000,000,000,000,000,000 denser than what we observe in our universe. So there was a prediction of “denser-than-steel dark energy everywhere,” something radically different from what we observe, but not any prediction of dark energy like we seem to have. Scientists did a poor job of predicting that airplanes would be invented. The famous scientist Lord Kelvin said in 1895 that heavier than air machines were impossible. Eight years later the Wright Brothers made their first flight. But even after the Wright Brothers had made quite a few successful test flights of airplanes, Scientific American published a report trying to provoke skepticism about whether the Wright Brothers were really flying. Scientists also did a pretty poor job of predicting space flight. Some mainstream scientists ridiculed the idea that men would one day travel in space, and before World War II very few scientists predicted that manned space travel would happen. Years before Einstein wrote a letter to President Roosevelt suggesting that nuclear bombs might be created, he stated in the early 1930's that there was “not the slightest indication” that nuclear power would be obtainable. At about the same time the leading nuclear scientist Rutherford said, "Anyone who looked for a source of power in the transformation of the atoms was talking moonshine." Turning to the mind and life, we find some important things that mainstream science failed to predict. During the past 50 years many astonishing cases have been discovered in which minds somehow keep on functioning well despite enormous brain damage. Such cases (sometimes described as cases of brain plasticity or brain resiliency) were not predicted by mainstream scientists. The phenomenon of near-death experiences was not predicted by any mainstream scientist before it was reported. Exciting discoveries have been made in recent years about the epigenome, suggesting that in rare cases certain acquired characteristics can be inherited through what is called transgenerational epigenetic inheritance. Far from predicting such a thing, mainstream scientists told us countless times in previous decades that the inheritance of acquired characteristics could never occur. Now let's look at some things that mainstream scientists have long predicted, but which haven't come true. It was predicted in the nineteenth century by scientists that innumerable transitional fossils would be discovered, showing the evolution of one species to another. The number of such fossils that have been discovered is a matter of debate, but it seems that there have been far fewer such fossils found than predicted – so few that it is often claimed that very few transitional fossils have been found. The same scientists predicted that we would find a tree of life showing a tree-like progression from the simplest forms to modern forms. But current attempts to map such a tree run into great difficulties, and the latest versions of attempts to create this “tree of life” show some weird shape that does not resemble a tree. It was predicted by scientists that fruit fly experiments covering hundreds of generations would show evidence of a new species emerging, or at least evidence of some kind of evolutionary improvement. Despite all kinds of artificial help to increase the likelihood of something dramatic emerging, such experiments have not shown any new species emerging. One scientific study covered 600 fruit-fly generations, and reported nothing more dramatic than a 20% shorter gestation period, which isn't even an improvement. The study's abstract concludes by stating “unconditionally advantageous alleles rarely arise, are associated with small net fitness gains or cannot fix because selection coefficients change over time,” all of which is disappointing for someone hoping to find good evidence for Darwinian assumptions. It was predicted repeatedly by biologists that most of human DNA would be found to be worthless “junk DNA.” But contrary to such a prediction, the ENCODE project found that at least 80% of human DNA has some functional purpose. For decades astronomers made it sound as if radio communication with extraterrestrials would succeed by our time. In the 1960's and 1970's scientists such as Carl Sagan were making it sound as if we could expect that radio contact with extraterrestrials would occur within a few decades. It's now 2017, and no such radio contact has been made. For at least 60 years, scientists have been speaking as if solving the problem of the origin of life was just around the corner. It's now 2017, and it now seems more difficult than ever to explain how life originated. Mainstream physicists predicted that the Large Hadron Collider would produce evidence for the popular physics theory known as supersymmetry. But the results from the Large Hadron Collider have done no such thing. Mainstream physicists also predicted around 1980 that evidence for grand-unification theories (GUT theories) would be produced in a few decades. Such evidence has not turned up. Mainstream scientists also repeatedly predicted that the Human Genome Project would produce a huge bonanza for medicine. As the project was going on in the 1990's, we were told countless times that the project would produce enormous progress in fighting diseases and cancer. Such a prediction followed from the reductionist assumption that DNA is not just one secret of life, but the secret of life, and that our biology can be almost entirely explained in terms of DNA. But such assumptions are wrong, and the predictions of a gigantic medical bonanza did not come true. The medical benefits from the Human Genome Project have been surprisingly slim. Scientists predicted that the Human Genome Project would identify about 100,000 genes in the human genome. But the actual number of genes found was only about 20,000. Another wrong prediction repeatedly made by mainstream scientists is the prediction that computers would become as smart as humans by about the year 2000 or 2020. Page 12 of the paper here gives a graph showing that 8 experts predicted that computers would have human level intelligence by about the year 2000, and that 8 other experts predicted that computers would have human level intelligence by the year 2020 (something incredibly unlikely to happen in the next few years). Mainstream science is good at making small-scope predictions, such as the prediction that a particular asteroid will pass a certain number of kilometers from Earth on a particular day, or the prediction that a certain biological or chemical reaction will occur if a person ingests a particular substance. Mainstream science is also fairly good at predicting future outcomes when there is a known trend such as global warming which can be simply extrapolated into the future. But when it comes to predicting what new discoveries about nature are down the road, it seems that mainstream science is not particularly good. The crystal ball of mainstream science seems very cloudy indeed. In the philosophy of science there is something called the miracle argument, which argues that the “predictive success of science” implies that scientific theories must mainly be true, or else this “predictive success” would be a miracle. This argument is invalid, because the predictive success level of mainstream science isn't particularly good, and mainstream science has merely been mediocre in predicting novel phenomena. Author of a best-selling book on UFO's, investigative journalist Leslie Kean has written a recently published book entitled Surviving Death: A Journalist Investigates Evidence for an Afterlife. The book includes some startling eyewitness accounts by the author, and has ten chapters written by various researchers (mostly PhD's or doctors) who have accumulated evidence relevant to this topic. The first part of the book deals with evidence for reincarnation. Such evidence was first systematically gathered by psychiatrist Ian Stevenson, who spent decades documenting cases of children who claimed to have had a previous life, often doing a birthmark corroboration that links birthmarks on the child with the cause of death of a previously living person. Stevenson was able to find many cases of children who reported past lives, with the details apparently matching the lives of previously living persons. His research has been continued by Jim Tucker, MD, who contributes a chapter to Kean's book. Kean describes an interview with a family with a son who claimed to have had a previous life as a minor show business figure. Kean presents a list of 55 similarities between the child's account and the life of a minor show business figure named Marty Martyn. On page 229 Tucker says that 70% of the children who claim to remember past lives say they died in their previous lives by violence, accidents or suicide. 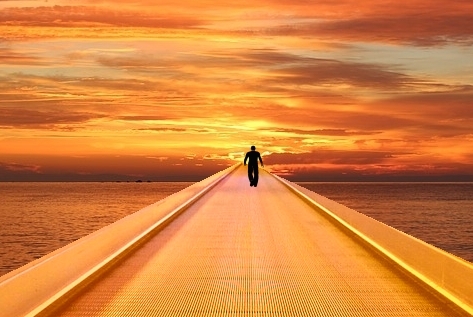 Could it be that reincarnation occurs only to those who didn't live to old age? It should be noted that a particular “past life” case never proves a universal tendency for people to reincarnate. There are always still possibilities such as voluntary reincarnation and the possibility that knowledge is being transferred in some paranormal way that does not involve reincarnation. The second part of the book deals mainly with near-death experiences. There is a chapter by a person involved in one of the most famous cases, the social worker who found on a hospital ledge a dark blue tennis shoe that a patient claimed to have seen while floating out of her body. One chapter discusses children who claimed to recall a life between earthly incarnations. We are told on page 128 that one in five children who claim to remember previous lives report remembering some otherworldly or heavenly existence where they existed between earthly incarnations. What is seen has been described to us variously as a “smoke,” a “gray mist,” a “white mist,” a “very wispy white shape,” seen leaving the body, usually from the chest or through the head. Some describe the air being wavy, like the heat haze of a mirage. It can also be an almost solid white form. In Part 3 of the book, Leslie Kean discusses her experiences with mediums, psychics who claim to be able to contact the dead. She discusses what she calls an “almost perfect reading” with a medium, one in which the medium mentioned 19 things that seemed to be accurate. There is a chapter by Julie Beischel, PhD, who has long done scientific research involving mediums, getting “highly statistically significant results” suggesting some real paranormal effect (an example of one of her papers is here). In Part Four of the book there is a discussion by psychic researcher Erlendur Haraldsson, PhD of observations of a large variety of stunningly paranormal phenomena produced by the Icelandic medium Indridi Indridason while he was in a specially constructed observation center created to observe the strange effects he was producing, under controlled conditions apparently offering no possibility for cheating. As reported at length here, Indridason was observed at length in such a center by some prestigious people such as a professor and someone who would later become a prime minister of Iceland. Such witnesses could find no evidence of trickery or fraud. In a similar vein, Kean discusses some utterly paranormal activity at a séance she attended. Not wishing to give too many “spoilers” about her book, I won't describe this jaw-dropping activity in detail. Nearly 400 pages in length, and including many references at the end, Kean's fascinating book is one of the more substantive treatments of life after death to appear in recent years. The book includes very many relevant accounts I haven't mentioned. Although the parapsychological significance of some of her personal accounts are debatable, Kean deserves credit for sticking her neck out and reporting astonishing personal incidents that many people might never reveal out of fear of being ridiculed. A dull, waxy, yellowish light accumulates around those who are about to die....This glow would seem to shine from underneath the patient's skin. Invariably, when I saw it, patients would die soon....I've seen patients precariously close to dying in the ICU, who have had this soft, candle-like light come into their being. Then it faded back to a crisper, cleaner white light as they recovered. But when the yellowish hue comes, the individual is near death. When newly awarded PhD's start writing papers and books and judging truth, they are rather like jurors who have been methodically exposed to evidence, and who then deliver a verdict that is a judgment of truth. A community of scientific experts may have much more prestige than a group of ordinary people chosen for a jury. But there are some reasons for thinking that the 12 ordinary people on a jury may be more likely to judge truth correctly than a clannish scientific community with some narrow subject specialty. Below are some of the reasons. One of the greatest strengths of the jury system is that jury members are randomly selected. A system in which jurors can volunteer for particular trials would not work well at all. If a particular defendant was on trial for murder, and jurors could volunteer for a particular case, then you might end up with only jurors predisposed to find that the defendant was guilty. Instead the jury system guarantees randomness. Jurors are randomly selected from the population. When they go to the court, they are randomly assigned to trials. So we usually don't end up with things like juries consisting mostly of people who were inclined to judge one particular way when judging a court case. But this random selection process differs greatly from how scientific experts become scientific experts. A scientific expert becomes a PhD by volunteering for some particular graduate program at a university. These graduate programs are often ideological enclaves, places where there predominates some particular ideology not embraced by most people. The fact that the graduates of such programs are volunteers creates the opportunity for sociological selection effects. Let's imagine an extreme example. Let's imagine there arises some new scientific discipline called groosology. It might be the opinion of 90% of the American population that groosology is utter nonsense. But groosology might be “all the rage” at some Graduate Program in Groosology Studies at a particular university. The people who sign up for such a program might almost all be from the tiny fraction of the population that believes in groosology. At this particular program there might then be tremendous sociological pressure for students to embrace groosology. So 90% of the graduates of this graduate program might be believers in groosology, even though a randomly selected jury from the general population would probably conclude groosology is worthless nonsense. The diagram below illustrates this type of sociological effect. Such a sociological effect is going on at many graduate programs at universities, which are often as much ideological enclaves as are theology schools. There is the additional fact that university graduate schools are not free, but often charge very high tuition fees, such as $30,000 a year. The number of scholarships for graduate programs is only a small fraction of the scholarships for bachelor's degree programs. 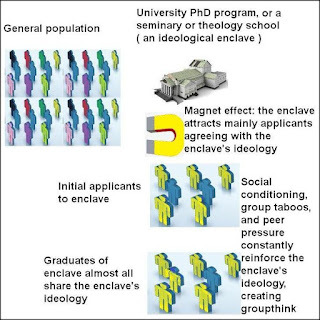 Such facts tend to guarantee that the people who sign up for university graduate programs are not merely people predisposed to accept the ideology of such programs, but are actually people particularly eager to accept such an ideology. For example, you are not likely to shell out $50,000 to be trained as an evolutionary biologist unless you were really enthusiastic about the prevailing thinking of evolutionary biologists to begin with. An equivalent situation in a jury pool would be if courts charged a high fee (such as $5000) for you to be a voluntary juror on a particular defendant's jury. This would guarantee that the juries would be populated only by those who were the most passionate about the defendant's guilt or innocence. One of the great strengths of the jury system and the court system is that equal weight is given to opposing sides. Imagine if someone is being tried for murder. First, the district attorney will give an introductory speech making the case for the defendant's guilt. Then the defendant's attorney will make a speech arguing for the defendant's innocence. Then the district attorney will present witnesses and evidence trying to establish the defendant's guilt, which at each stage may be challenged or cross-examined by the defense attorney. Then the defense attorney will present witnesses and evidence trying to establish the defendant's innocence, which at each stage may be challenged or cross-examined by the district attorney. Finally the district attorney will summarize the case for the defendant's guilt, and the defense attorney will summarize the case for the defendant's innocence. What could be more even-handed? How would it be if juries had such experiences? We might imagine a jury that would hear only the prosecuting attorney's case, without ever hearing the defense attorney's case (or a jury which heard only the defense attorney's case, without ever hearing the prosecuting attorney's case). If you are a juror, you are not socially pressured to have a particular opinion until you get into the jury room to reach your verdict. Jurors are silent while a trial is proceeding, and jurors are instructed not to talk about a case during a trial, until the final jury discussion after the evidence has been presented. So there is no peer pressure for you to think in a particular way until the very end of the process, nor is there any authority figure asking you about whether you have conformed to the expected thinking. But it is a very different situation for the student training in a scientific graduate program. The student will be constantly asked to take tests and write essays, and he may be graded partially according to whether he accepts whatever ideology he is being taught. For example, someone training to be a neuroscientist may be asked to explain how memory works, and he may be graded by how well he parrots prevailing theories, and may be graded poorly if he suggests such theories are unbelievable. Having made a huge investment in tuition, the student is almost forced to “deliver his verdict” on the truth of what he is being taught before his training has finished; or he may risk flunking his courses and losing his huge tuition investment. If you are a juror and get into the jury room, you will have no vested interest or financial interest in reaching a particular verdict. You can then reach an opinion solely on the facts, knowing that it will make no difference to your financial health. But we may contrast this with the person who has just graduated from a university graduate school. His financial health will now depend on conforming to whatever ideology was taught at his graduate school. If he speaks as if he accepted the prevailing ideas in his little science community, he will have a decent chance of getting research grants, and might even be appointed to be a professor (a decision that will be made by professors who have embraced the ideology of his scientific community). But imagine if this person announces a contrarian verdict. Imagine if he states that he disagrees with the conclusions of his scientific community. Such a person will have placed himself “out on a limb,” and his position will be financially precarious. He will have a hard time getting scientific journals to publish his scientific papers, since peer reviewers often exclude papers suggesting results contrary to the ideological taboos and norms of a scientific community. Lacking much of a publication record, and out of sync with the thought of those who decide whether he should be appointed as a professor, he won't be able to get appointed as a professor. So many of our newly minted PhD's are like bribed jurors. They have a strong financial incentive to reach particular conclusions. If something similar were to go on with juries, we might imagine a situation like this. Near the end of the trial, when you went into the jury room to reach the verdict, you would find various pitch men who would tell you that if you voted in one particular way, you would be paid $10,000. I can put all these observations together into a portrait of what it would be like if being a juror was like studying to become a scientist at certain types of graduate programs. Things would work like this. The only way in which you would become a juror would be if you paid a big fat fee to sit on a particular jury – something like $20,000 or $40,000. Once you got on that jury you would find yourself with other jurors who had all volunteered for the particular case you were to judge on, jurors who had all paid large sums to sit on the jury. During the trial you would only be presented with one side of the case, the case of the prosecuting district attorney. During the trial breaks, you would have authority figures come to see you and your fellow jurors. They would ask you questions to make sure that you were absorbing and accepting the government's case, and they would try to squash any skepticism you might have about that case. Once the case had been presented, you and your fellow jurors would finally find yourself in the jury room, assigned to the task of reaching the verdict. But before you started, you would talk with various people who would offer you huge bribes to vote as the prosecuting district attorney wanted you to vote. You would know that rejecting authority and thinking independently would be very financially disadvantageous. In the description above, the giant fee required for sitting on a particular jury corresponds to the tuition price of getting a graduate degree. The situation of hearing only one side of the case corresponds to the fact that you are pretty much taught only one standpoint if you sign up to get a degree in something like Freudian psychoanalysis, string theory, evolutionary biology or neuroscience. The part about trial breaks corresponds to the fact that graduate students are constantly monitored and graded in accordance with how well they are absorbing their indoctrination without resisting it. The part about the bribes in the jury room corresponds to the fact that any newly minted PhD knows that he will flourish financially by singing from the same hymn book as the other scientists in his specialty, rather than going out on a limb and judging that such scientists have come to wrong conclusions. We don't have such a jury system like the one described above. We have instead a totally different system designed to maximize the chance the jurors will reach impartial decisions after hearing both sides. The common person who takes part in such a system – sometimes a low-paid cleaner, driver, or cashier – does not have the prestige of a scientist. But due to the strengths of the jury system, such a person may be more likely to judge truth correctly and objectively than some person with a fancy title who may be the assembly-line end-product of the mind-molding conformist machinery of an ideological enclave. 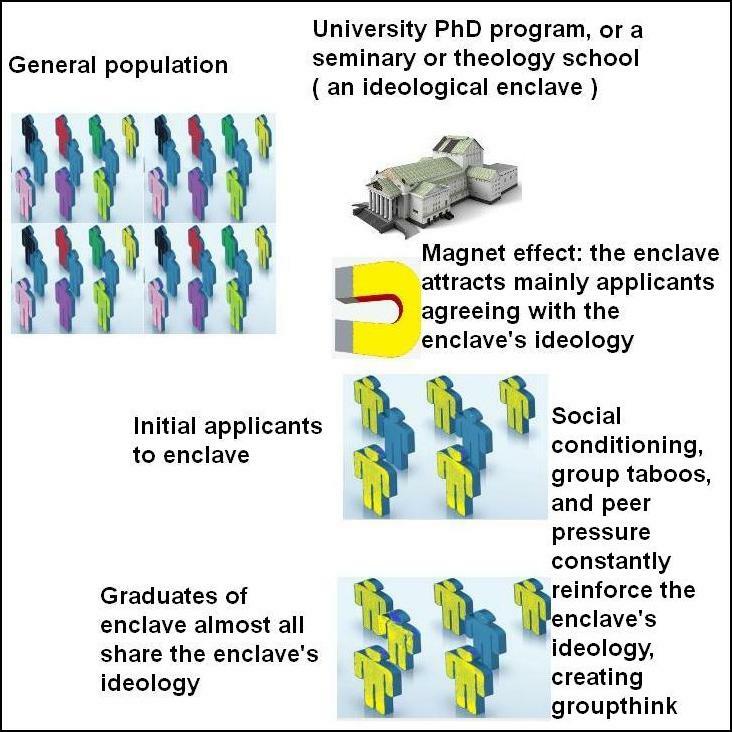 From the sociological considerations above, we can deduce some general tips that can be used by any person wishing to create an ideological enclave that will generate graduates that all share the same ideology. Make it perfectly clear that your institution will be teaching a particular ideology (but avoid using that particular word). Charge a very hefty annual tuition, making sure that the only people who sign up for the school are people strongly predisposed to believe in whatever ideology you will be teaching. Give your students a one-sided curriculum that indoctrinates them in your ideology, with little or no exposure to alternate viewpoints. Require that your students repeatedly voice assent to your ideology as you are teaching it, by doing things such as having tests in which the correct answers are those reflecting your ideology, and written essays that will be graded poorly if they do not reflect your ideology. Flunk out students who show signs of rebelling against your ideology, or simply leave them in some “uncompleted curriculum” limbo that causes them to quit. During the months leading up to graduation, make it perfectly clear that your graduates will enjoy a lucrative career in your organization and similar organizations if they continue to voice the ideology that the school has taught, but that they will receive no financial reward at all for their huge tuition investment if they defy that ideology. This should work like a charm, and 90% of your graduates will probably end up voicing approval for whatever strange ideology you have taught them. Sadly the description above doesn't differ very much from how certain types of scientific specialists are trained. Postscript: My previous post The Groupthink Problem in Modern Cosmology and Physics discusses complacent conformity problems in two branches of science. In my post Improving the Conformity Factories Known as Science Graduate Schools I give some ideas on how to lessen some of the "rubberstamp thinking" problems mentioned in this post. Besides the ideas discussed in that post, I can think of an additional way to reduce the problem: fund scholarship programs that offer "take it or leave it" full-tuition scholarships to randomly selected college seniors, offering to pay the entire cast of graduate education in one particular scientific area, without any option to change the field of study. For example, a randomly selected English major might suddenly receive an offer to pay the full cost of becoming a PhD in neuroscience, with no option to change to some other PhD program. With such a program, you would have a higher percentage of graduate school beginners who were not predisposed to accept the ideology of a particular graduate program. An additional idea is to set up a large prize fund consisting of many individual financial awards to be awarded only to scientists who publish results that contradict prevailing assumptions in their field. A good name for such a fund would be: the "Shock to the System" awards. Judging from materialistic assumptions about the brain and the human mind (the idea that our minds are purely the product of our brains), we would expect there to be a high correlation between brain health and mental function. We would expect from such assumptions that there should be as high a correlation between brain health and mental function as there is between leg muscles and running speed. But surprisingly such a high correlation does not seem to exist. The correlation between brain health and mental function seems to be merely a low correlation. I will now present some facts to support this claim. First let's look at some results concerning strokes. The study here tested emotional intelligence in 32 patients who had strokes in the frontal lobes, claimed to be the crucial brain parts relating to intelligence. The study found that such persons had an average emotional intelligence of 87 – significantly less than the average of 100, but not a very big difference. This article in US News and World Report says, "It’s important to recognize that strokes do not cause a drop in overall intelligence.” This paper refers to “the generally minor effect of stroke on IQ” in children. At age 43, patient CG sustained a cerebral hemorrhage and a few months later, she suffered a second (ischemic) stroke. As a result, she exhibited extensive damage of the right hemisphere (including frontal, temporal, parietal, and occipital regions), left Sylvian and striatal areas, bilateral portions of the insula and the amygdala, and the splenium. However, against all probability, she was unimpaired across a host of cognitive domains, including executive functions, attention, memory, language, sensory perception (e.g., taste recognition and intensity discrimination), emotional processing (e.g., experiencing of positive and negative emotions), and social cognition skills (prosody recognition, theory of mind, facial emotion recognition, and emotional evaluation). Even more striking are her mnemonic skills: her procedural and semantic knowledge is fully preserved, as shown in her smooth execution of various action routines (e.g., handling her cell phone, tying her shoe laces) and her intact naming and classification skills (e.g., she could flawlessly denominate all the objects she had thematically organized in different sections of her purse); furthermore, her declarative memory is extremely detailed for events which happened weeks, months, and even years ago. She could describe scenes from her childhood and adolescence, she meticulously narrated episodes occurring immediately before and after her strokes, she remembered the names, specialties, and suggestions of all her doctors, and she could recount details of dozens of books she had read throughout her life. One of the big challenges we face with Alzheimer's is that brain cell destruction begins years or even decades before symptoms emerge. A person whose disease process starts at age 50 might have memory loss at 75, but by the time we see the signs, the patient has lost 40 to 50 percent of their brain cells. In Alzheimer’s, brain cells start to die 10, 15, or 20 years before symptoms appear. By the time we observe memory lapses, 40 percent to 50 percent of brain cells are gone, and it’s too late to make a difference. These statements are astonishing. If our memories are all stored in our brains, why would you have to lose 40 to 50 percent of your brain cells before people started noticing your memory loss? Again, this suggests merely a low correlation between brain health and mental function. The paper here studied memory effects in 63 patients who had undergone surgery for brain cancer, in addition to other patients who had undergone both brain surgery and radiotherapy. 91% of these 63 patients experienced “no deterioration” in immediate recall; 80% experienced “no deterioration” in delayed recall; and 77% experienced “no deterioration” in recognition. This is a relatively low correlation between brain damage and memory, particularly considering that about half of the patients had 2 or more brain metastases (areas in which the cancer was growing). Figure 8 of this paper gives us a graph that compares verbal IQ with brain tumor size in a variety of brain cancer patients. Under materialist assumptions, we would expect that there should be a strong inverse correlation between something like verbal IQ and the size of a brain tumor; the bigger the brain tumor, the lower your verbal intelligence should be. 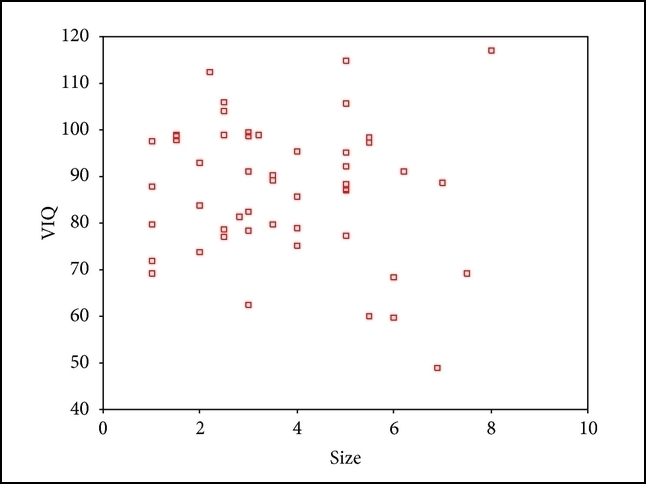 But what we see is only a low correlation – a correlation of only .28. 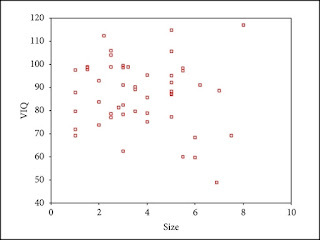 High correlations have values like .75 or .85. Astonishingly, the person with the highest verbal intelligence had the biggest brain tumor, and the person with the second highest intelligence also has a very large brain tumor. When we consider sudden traumatic injury to the brain, we also find some cases where the correlation between brain health and mental function seems to be merely a low correlation. One astonishing case is that of Gabby Giffords, a US congress representative who was shot at point-blank range in the back of the head. Not only did she live, but (as discussed here) she has recovered to a remarkable degree, to the point of being able to bike, and speak clearly (although in shorter sentences). A similar case was the famous case of Phineas Gage, a nineteenth century railroad worker who had a thick iron railroad spike accidentally drive through his skull, piercing his frontal lobes. A physician soon reported after examining Gage that he was “quite recovered in his faculties of body and mind.” Gage seems to have had some personality changes later, but such changes are trivial compared to what we would have expected from such an injury under materialistic assumptions about the brain. There's a young student at this university, who has an IQ of 126, and has gained a first-class honors degree in mathematics, and is socially completely normal. And yet the boy has virtually no brain. Then there was the case that the Reuters new agency reported with the headline, "Tiny brain no obstacle to French civil servant." It told the case of a well-functioning civil servant who had merely a "thin sheet of actual brain tissue." Reuters was reporting on a case described in the medical journal Lancet. Then we have the case of savants, people like the late Kim Peek who could remember 98 percent of what he had read in more than 7000 books. Savants sometimes have a strange combination of brain damage and memories better than those of ordinary people. Such cases are not at all compatible with the conventional thinking of neuroscientists that the human mind is merely the product of the brain. But such cases are compatible with the assumption that the human mind is mainly the product of some mysterious reality beyond our understanding: a soul or some cosmic consciousness infrastructure much greater than a human body. 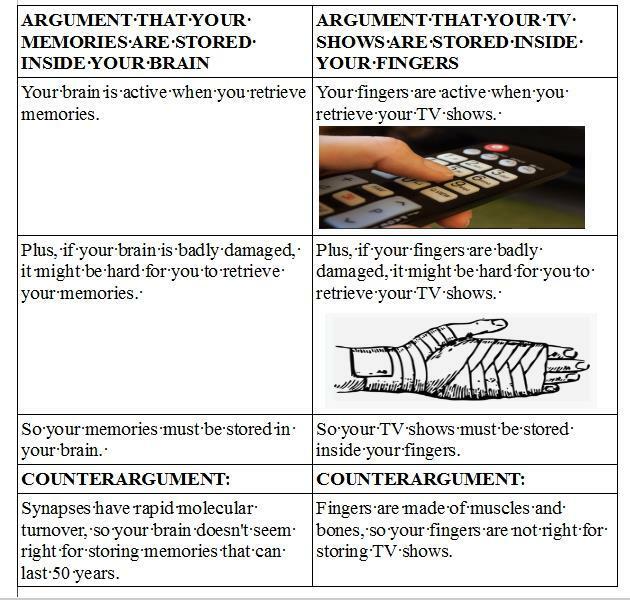 There are three big reasons for thinking that our minds and memories are not merely products of our brains. The first reason is cases like the ones discussed in this post. The second is the inability of neuroscience to plausibly account for the mental function we observe in humans. Scientists cannot plausibly account for the storage of human memories lasting for 50 years. The leading theory to explain this holds that such memories are stored in synapses, but that theory is untenable because synapses are subject to rapid molecular and structural turnover which should make them incapable of storing memories for longer than a year. Nor can scientists explain such simple things as how brains can retrieve memories instantaneously like humans do (which creates all kinds of "how did you know where in your brain that memory was stored" issues). Nor can scientists explain how neurons could possibly do something such as forming an abstract thought (not just the perception of a single bird, but the generic abstract idea of a bird). The third reason for thinking that our minds and memories are not merely the products of our brains is the fact that there are many well-established cases of psychic phenomena (such as ESP and near-death experiences), which we cannot explain under "your mind is merely the product of your brain" assumptions. The visual below illustrates the type of reasoning used by some people to try to establish conventional assumptions about the brain, and why such reasoning is not convincing. Do the “Easy Life” Guys Want 8 Billion Bucks for Metaphysical Reassurance? On the Ars Technica website, there is a very detailed and lucid explanation of NASA plans to search for life on Europa, a moon of the planet Jupiter. The mission described is fascinating, but it may be a case of people who want to spend 8 billion dollars to reassure themselves that their dubious philosophical assumptions are correct. The mission seems to be all about proving an “easy life” hypothesis, one which seems to be very unlikely to be true from a purely scientific standpoint. Europa is believed to be covered with a thick layer of ice, but it is believed that deep below that ice is a watery ocean. 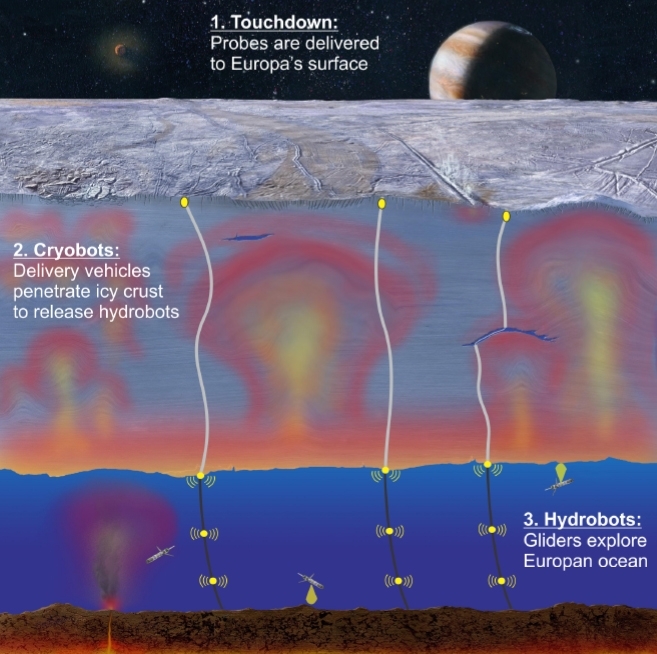 The plan is to land a robot probe on the icy surface of Europa. The probe will then drill down into the ice, looking for signs of life. 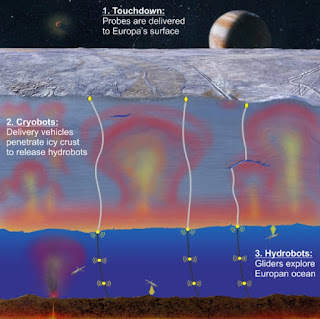 Advanced plans for searching for life on Europa have always looked like the plan shown in the NASA visual below. Under such plans a probe would release something that drills down through the ice, and makes contact with the ocean below. When I read the Ars Technica article, I was expecting to hear about a mission such as this, one that would somehow make contact with Europa's ocean underneath its ice. But the article did not describe such a mission. It merely described a mission that would drill down a little into the ice, and look for signs of life inside the ice. There are two reasons why such a mission seems like a gigantic boondoggle that will almost certainly fail. The first and lesser reason is that even if life had evolved in an ocean underneath Europa's thick icy layer, it is unlikely that signs of such life would pass up all the way through such a layer of ice. That ice is believed to be between 15 and 25 kilometers thick (10 to 15 miles thick). It seems unlikely that any type of organism could survive a journey through such a thick layer of ice. The second and better reason why such a mission seems very unlikely to succeed is that the chance of life appearing in an ocean of Europa seems extremely low. To calculate this chance, we must consider all of the insanely improbable things that seemed to be required for life to originate from non-life. It seems that to have even the most primitive life originate, you need to have an “information explosion.” Even the most primitive microorganism known to us seems to need a minimum of more than 200,000 base pairs in its DNA (as discussed here). Scientists have been knocking their heads on the origin-of-life problem for decades, and have made little progress. The origin of even the simplest life seems to require fantastically improbable events. Protein molecules have to be just-right to be functional. It has been calculated that something like 1070 random trials would be needed for a functional protein molecule to appear, and many such protein molecules are needed for life to get started. And so much more is also needed: cells, self-replicating molecules, a genetic code that is an elaborate system of symbolic representations, and also some fantastically improbable luck in regard to homochirality. Mother: Why are you leaving us and heading 2000 miles to Hollywood? The chance of you becoming a star is one in a million. Daughter: No, it is inevitable that I will become the world's greatest starlet. When you are faced with a mathematical reality that something that you want to happen is very unlikely to happen, it is very effective psychologically to “cross out” this troubling improbability by maintaining that the thing is not unlikely at all, but instead has a probability of 100%. 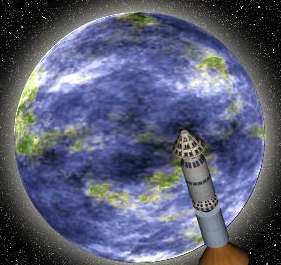 In the case of the proposed Europa mission, we have a mission that we might describe as “Desperately Seeking Easy Life.” Some people pitching such a mission want very much for their “easy life” hypothesis to be proven, and they are asking for 8 billion dollars of taxpayer funds so that they can achieve this metaphysical reassurance, and say to themselves, “I'm so relieved – Earth wasn't so lucky!” It's basically the kind of “give me lots of money so I can be reassured about my assumptions” thing that would go on if a fundamentalist group were to ask for millions of taxpayer dollars to fund projects digging underground looking for Noah's ark. Looking at the probability of life arising by pure chance in Europa's ocean, a purely chemical and biological assessment must rate the probability as being extremely low. Now it is true that there may have been some additional factor involved in the origin of life on Earth. Perhaps life got started here through the action of some divine being or the action of extraterrestrial visitors. But while such a higher power may have acted to spur the start of life on many planets in our galaxy, the chance of such a higher power working to create life in some buried ocean underneath 20 kilometers of ice seems much smaller. So even if we throw in the possibility of some additional power helping life appear in our galaxy, it still seems unlikely that life would exist in Europa's ice-buried ocean, given all of the fantastically improbable things that have to happen for life to appear from non-life. The proposed Europa mission seems like a fantastically expensive “shot in the dark” that is very unlikely to succeed. Even if some hint of life were to appear, it might well be some ambiguous signal like the one produced by the 1976 Viking mission to Mars. A mission putting cameras down into Europa's ocean might conceivably yield fascinating footage of swimming creatures. But a mission drilling only a little into the ice (like the currently proposed mission) would merely yield some numerical data that might be of interest only to scientists. Such data probably would still be subject to debate, and would be unlikely to give a final decisive answer as to whether life exists on Europa. Another such program is the search for atmospheric signs of life from planets revolving around distant stars. If the origin of life is easy, and life is all over the galaxy, we can expect that soon our space instruments will start showing up by-products of life (such as abundant oxygen) in the atmospheres of extrasolar planets. So an advocate of the “easy life” hypothesis cannot claim that the Europa mission is essential to test such a hypothesis, as the hypothesis will be tested by other programs searching outside of our solar system. Postscript: The selling point constantly made for SETI outside of our solar system is: there are so many planets where life might have appeared, so eventually we'll find something. But that argument cannot be used whenever you are talking about searching for life on one particular moon or planet. Think of it this way. Investing in some telescopic search of many stars (or a radio search of many stars) is like buying two big stacks of lottery tickets. But sending a robot mission to look for life on one moon or planet is like buying a single lottery ticket, and just as unlikely to pay off. 8 billion dollars is way too high to pay for a lottery ticket.